The global healthcare consulting services market is expected to reach USD 15.88 billion by 2023 from USD 8.99 billion in 2017 and, at a CAGR of 10.2%. 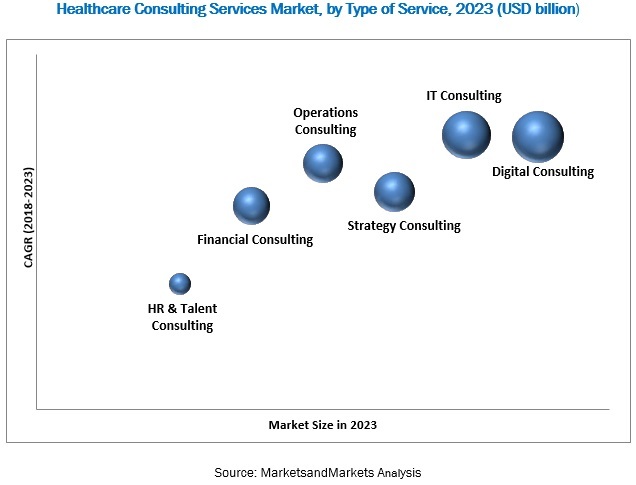 According to the new market research report "Healthcare Consulting Services Market by Type of Service (Strategy Consulting, Digital Consulting, IT Consulting, Operations Consulting, Financial Consulting, HR Talent Consulting), End User & Region - Global Forecast to 2023", published by MarketsandMarkets™, the global Healthcare Consulting Services Market is projected to reach USD 15.88 billion by 2023 from USD 9.76 billion in 2018, at a CAGR of 10.2%. Don’t miss out on business opportunities in Healthcare Consulting Services Market. Market growth is primarily driven by the growing geriatric population, the rising importance of value-based care; and technological advancements in healthcare. Browse and in-depth TOC on "Healthcare Consulting Services Market"